Finite math takes everything you've learned in your previous math courses and brings them together into one course with a focus on organizing and analyzing information, creating mathematical models for approaching business decisions, using statistics principles to understand future states, and applying logic to data organization. 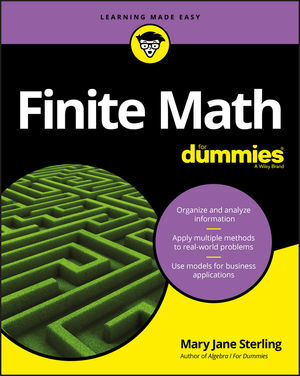 Finite Math For Dummies tracks to a typical college-level course designed for business, computer science, accounting, and other non-math majors, and is the perfect supplement to help you score high! If you’re not a math person or just want to brush up on your skills to get a better grade, Finite Math For Dummies is your ticket to scoring higher! Mary Jane Sterling is the author of Algebra I For Dummies, Algebra Workbook For Dummies, and many other For Dummies books. She taught at Bradley University in Peoria, Illinois for more than 30 years, teaching algebra, business calculus, geometry, and finite mathematics.